The Vinitaly International Academy (VIA) is proud to bring the adventure of Italian wine to the US this year with its first 2019 Italian Wine Ambassador certification course to be held in Los Angeles, California, from February 18th to 22nd (applications are currently being accepted). The location for the 11th edition of this highly-professionalizing training course is the gorgeous boutique hotel The Line located in the heart of trendy K-Town, between Hollywood and downtown LA. 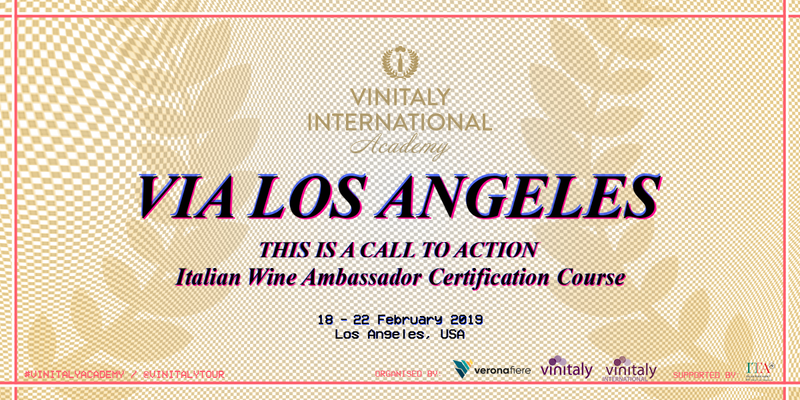 Vinitaly International in collaboration with Veronafiere and the support of ICE – Italian Trade Agency are working on the finishing touches of the Los Angeles edition of the VIA Italian Wine Ambassador certification course next February and enrollment is still open. The re-formatted, tasting-intensive Italian wine course is taught by VIA Faculty Sarah Heller MW and Henry Davar, both experienced professionals and educators. Sector professionals who want to be challenged and take an in-depth survey of Italian wines and their native grape varieties are welcome to submit their candidacy for this rewarding course. The course will expose candidates to the theory behind Italian wine with lectures on grape varieties, styles, and terroirs. Both guided tastings and self-guided tasting labs will also be a huge component of the curriculum, allowing students to practice tasting in preparation for the final exam. The U.S. emerged as Italian wines’ largest market based on value. U.S. sales are expected to top $2.49 billion (€2 billion) in 2022, which is up from $1.99 billion (€1.6 billion) last year. Moreover, among the 50 States, California is the area where wine consumption is at the top, with an overall volume of 148,347 gallons, as documented in a report compiled by the National Institutes of Health and discussed in a recent article in VinePair. California, according to this report, is also the top state for wine production, producing roughly 90% of American wine. The size and importance of the U.S. wine market and the crucial role of the state of California have been determining factors that pushed VIA to stage the Italian Wine Ambassador certification course in Los Angeles. With a growing market, more wine professionals are needed, particularly professionals with well-rounded knowledge of the wine product and consumer trends. The Italian Wine Ambassador certification course provides an answer to this very need. There are 3 aspects that I enjoyed: they go in depth into some of the grape varieties; the second point is the tying of the grapes to the region and the wines; and the last thing I like about the course is that there is a lot of background information, historical references, and food culture. Students sampling Italian wines during the numerous tasting sessions of the VIA Italian Wine Ambassador certification course. (In Hong Kong) I met other people that share the same passion. Being part of VIA is great because our final goal at the end of the day is to get to know Italian wines and share our knowledge to the rest of the world. I am very proud of being part of VIA. The VIA community today counts 170 certified Italian Wine Ambassadors and Experts, but since its inception in 2014 it engaged more than 450 wine professionals worldwide. Applications for the Los Angeles Italian Wine Ambassador certification course are currently being accepted. 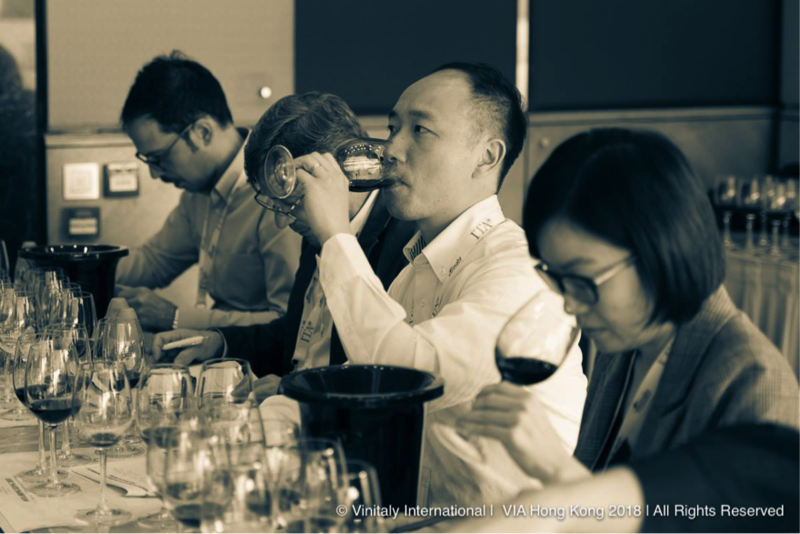 The application form can be filled in on the Vinitaly International Academy website and additional information on the course and the venue can also be requested at via@vinitalytour.com.